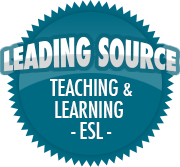 Addressing Frequent Failure in ESL Classrooms | So, You Think You Can Teach ESL? This is a really comprehensive piece of information that we should all listen to. Yes there needs to be alot of communication in the classroom and sadly that is often the difference between the ‘okay language centre, and the ‘GREAT language centre!’. I do think it all comes down to the teacher. If the teacher feels confident to let students speak, there have already conquered the first mountain. After that it is just coming up with interesting activities (which you have included above!) but also understanding the whole reason why communication is the key in this all. However also there are some students (of which we have all have some, that just find learning a language really difficult. Often it seems like they are really ‘left brained’. It doesn’t mean they can’t learn, it just means they need many different strategies to help them. That’s the challenge for the teacher. Thanks for commenting! I agree that sometimes, student progress does come down to the teacher and other times the students may have difficulty learning a new language. It’s hard to accept that some students just cannot learn another language. Part of being a great teacher, in my opinion, is knowing your students’ abilities and helping achieve their best in whatever they excel at. If a student cannot learn a second language, then find out what the student can do well and help them find the right resources to do well. Exactly…I will never be an Olympic gymnast…something I learned very early on, so moved more towards the arts!